Hello everyone it’s Connie, the baby and the cutest one in the family. So happy to share with you a dress I just finished for my grand child Eden. She will LOVE that Grammy Bear sent her a gift. It’s my youngest granddaughter’s second birthday coming up and I wanted to make something special. 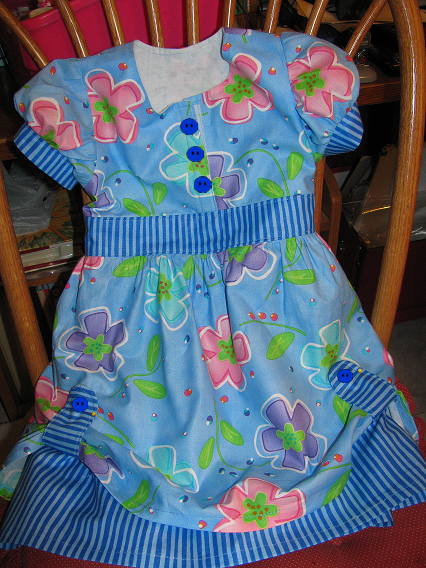 I bought this pattern to make this dress for Eden, but with all my travels, I never got to it. It’s called the Addison. Here’s the back of the dress. I can’t wait to see it on her. this little bird has been hanging on our deck here the past two days. He looks totally roughed up, but he let me get with in 5 feet of him, he keeps coming back.